There are two main schools of thought when it comes to enthusiast case design. One can be thought of as attention-seeking: make it as flashy, splashy, and eye catching as possible. The other is most often described as minimalist: strip the design down to bare essentials, keep the design accents subtle. 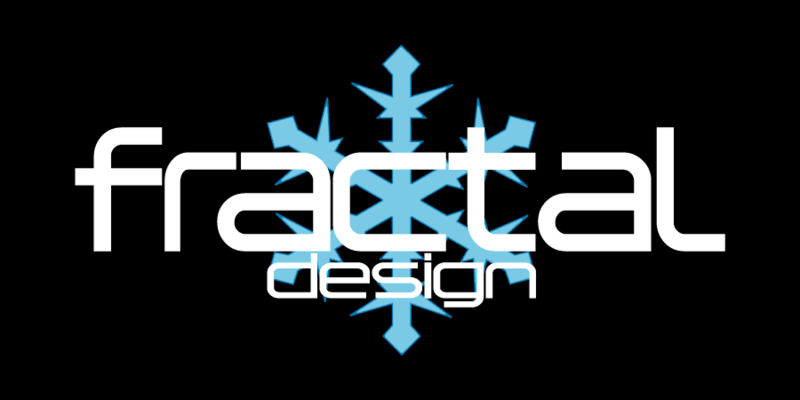 Fractal Design has an established reputation in the second school, and today we’re going to be taking a look at one of their latest efforts: the Define R4. Taking inspiration from the Arthur C. Clarke school of design, the Define R4 is for the most part rectangular, smooth, and silent. Opening up the front door, we begin to see why; all of the places most likely to emit noise have been baffled and dampened. Opening things up a bit further, we began to see the ingenuity that has gone into this case’s design. The intake fan cover, which is held shut by a pair of spring-loaded latches, conceals a snap-in assembly which can house a mesh-filtered pair of fans in 120 mm or 140 mm. 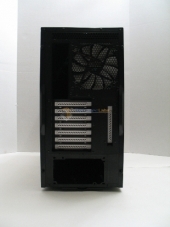 One 140 mm fan comes pre-installed in the lower slot. The side panels are, as you might expect, flat matte black and featureless except for a single fan port on the left side panel. 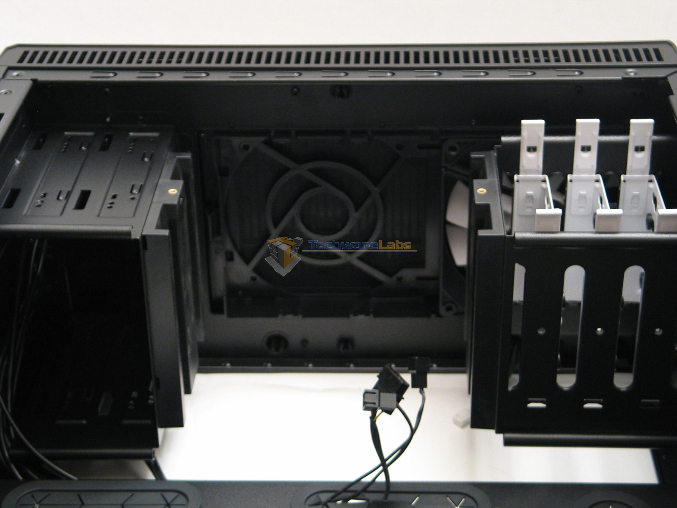 This port comes blocked and baffled by default, and like all the other fan ports on this case it can accommodate either a 120 mm or a 140 mm fan. Removing either panel can be accomplished by removing a pair of thumbscrews and pulling on the handle. The panels’ inner sides are covered in a hard, closed-cell foam, though the fan port on the left panel sports a softer foam covering. While this might not be as effective as cutting the entire panel in soft foam, this harder material does not absorb dust as readily and will likely last longer. While this case is on the compact end of the mid-tower format, it is hardly cramped. The motherboard tray has a generous cut out around the CPU socket to allow you to exchange cooler back plates without tearing the system down completely. 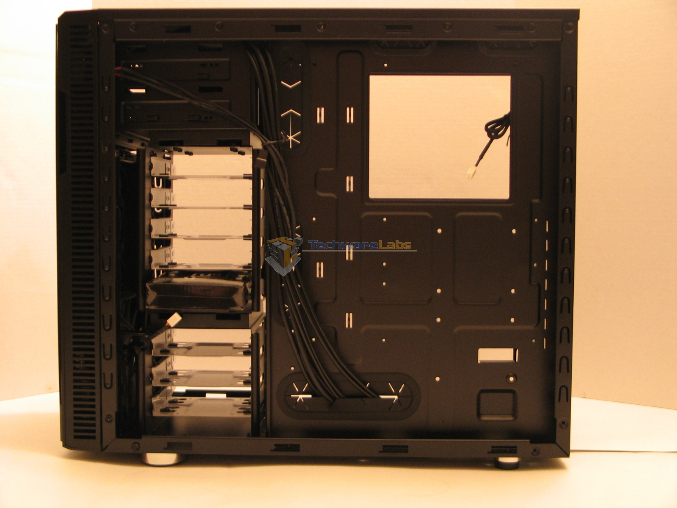 Rubber-grommetted cable routing slots are provided above, beside and below the motherboard mounting area. 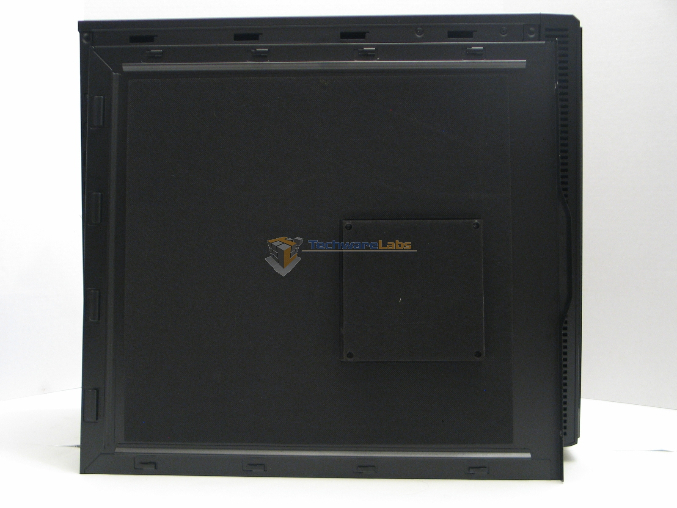 In front of the tray, two 5.25” bays sit atop two hard drive cages providing a total of eight slots for any mixture of 2.5” and 3.5” drives. 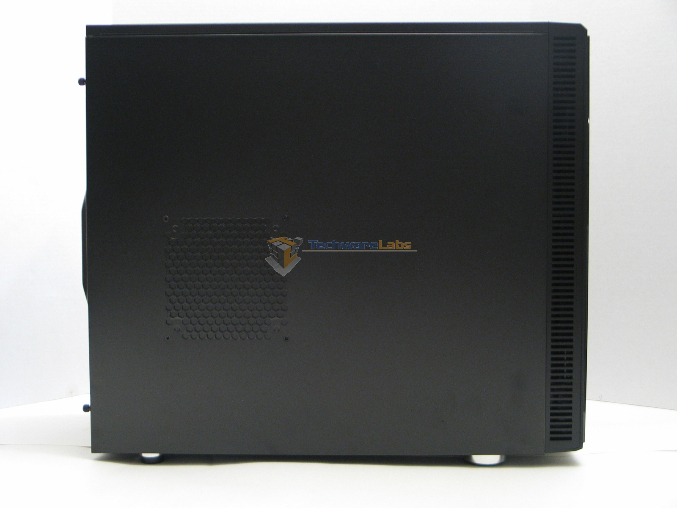 The Define R4 is somewhat wider than normal, and the case’s extra width provides plenty of room for cable management. 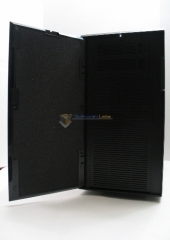 Tie-down spots are provided down the center line of the case, and can accommodate your choice of Velcro straps or zip ties. 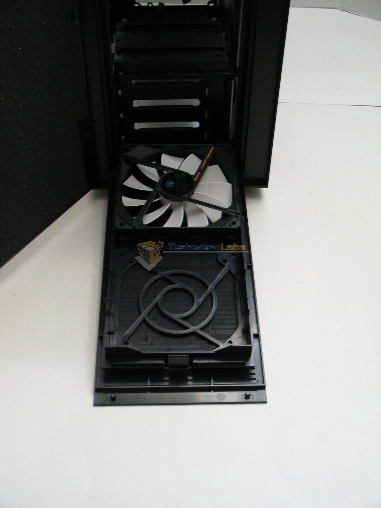 Turning our attention to the bottom of the case, the salient features here are the large rubber feet and the filtered fan intakes. The rubber feet won’t completely prevent the case from transmitting vibrations to the floor, but neither will they deform under the weight of a fully loaded system the way silicone feet would. 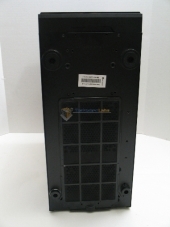 The mesh filter, which slides out to the rear for cleaning, covers both the PSU and yet another dual size fan port. 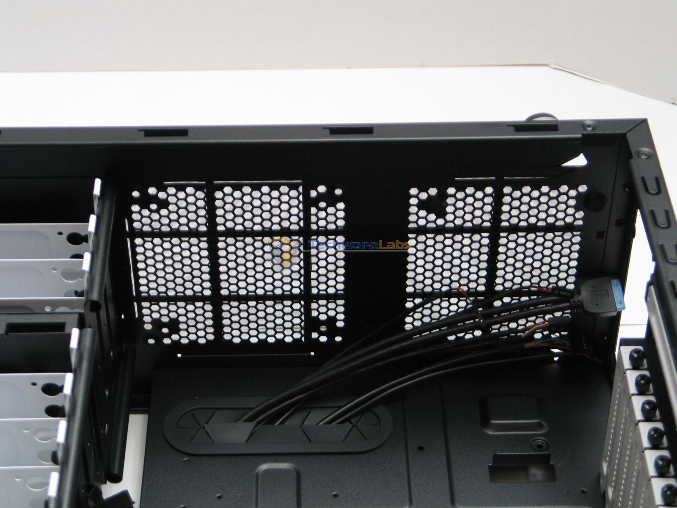 The PSU itself sits on four small foam pads. 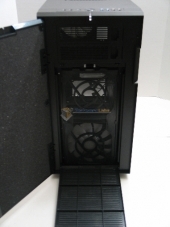 On top we have two more dual size fan ports, positioned to allow for a dual 120 mm or dual 140 mm radiator. The deformation in the case visible in this shot is the result of minor shipping damage; be sure to check for holes or dents in the box before you accept delivery. The rear of the case is where its extra width is most apparent. 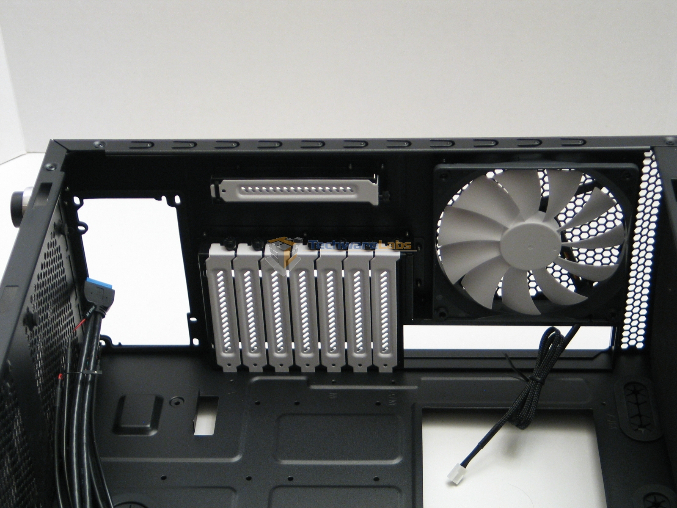 Aside from yet another dual size fan port, an extra expansion slot is provided for things like extra port headers. 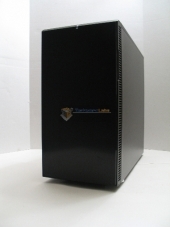 No ports are provided for an external water-cooling loop; this case is meant to be an air-breather. 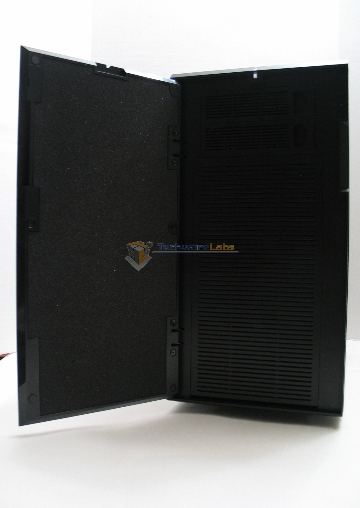 As with the left side panel, the fan ports on top of the case are covered and foam-padded by default. 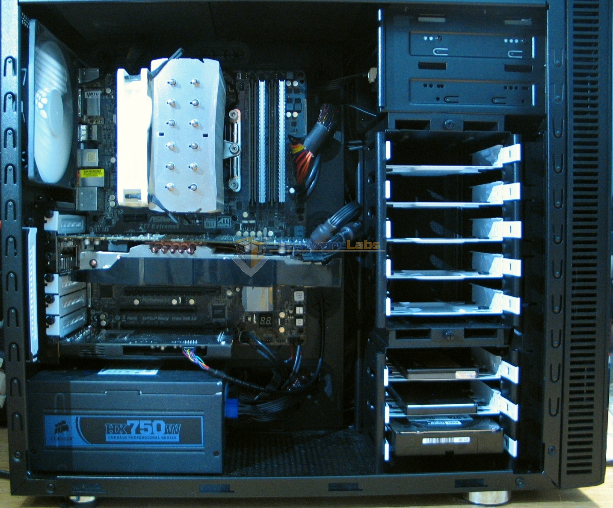 In front, the upper hard drive cage can be removed entirely as shown here or mounted sideways to provide an extra airflow channel for the system’s hotter components. The bottom hard drive cage can also be removed, though this requires removing about a dozen well-tightened screws. 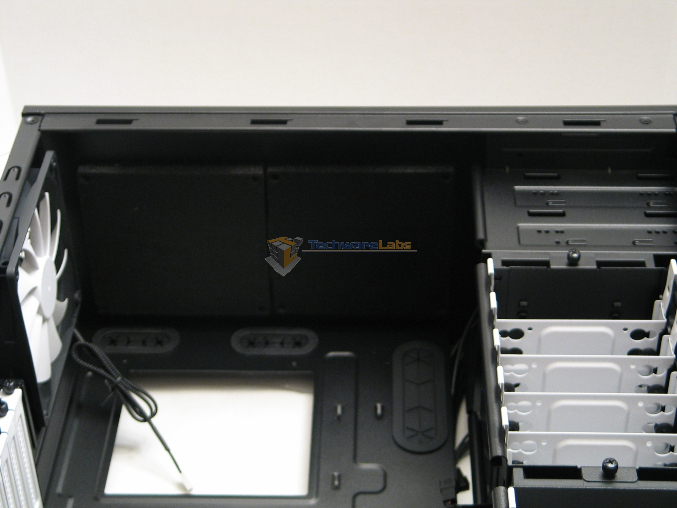 The expansion slot covers are easily removed and replaced, though the thumb screws on our review unit were over-tightened at the factory, which made removing the cover on the extra sideways slot a bit tricky. 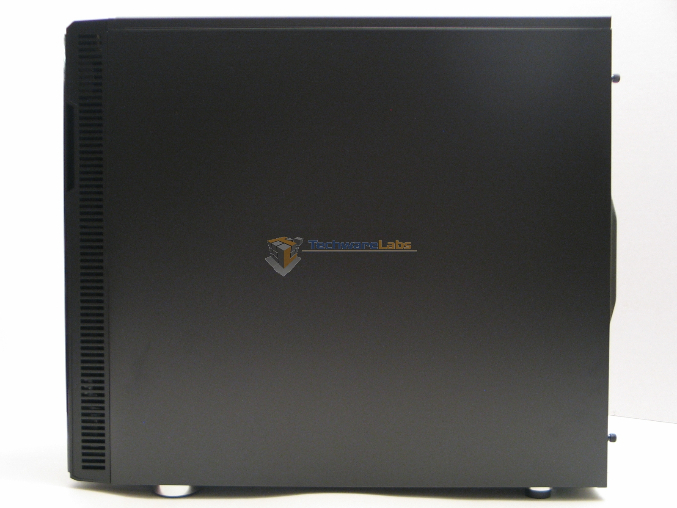 As at the front, a 140 mm fan comes pre-installed. Though things got a little snug with a full-length graphics card installed, I had no trouble routing everything where it needed to go. 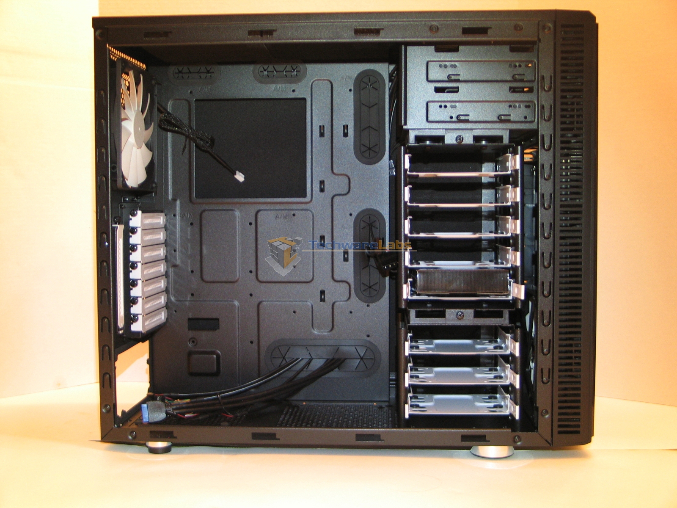 The extra space behind the motherboard tray and numerous tie-down points made it easy to keep the cables under control. The built-in three speed fan controller also helped in this regard, allowing me to keep those otherwise troublesome cables out of sight behind the motherboard tray. In terms of noise, this case is excellent. With all of the fans going at full speed, it produces no more than a quiet hum. At anything less than that, it drops into inaudibility. 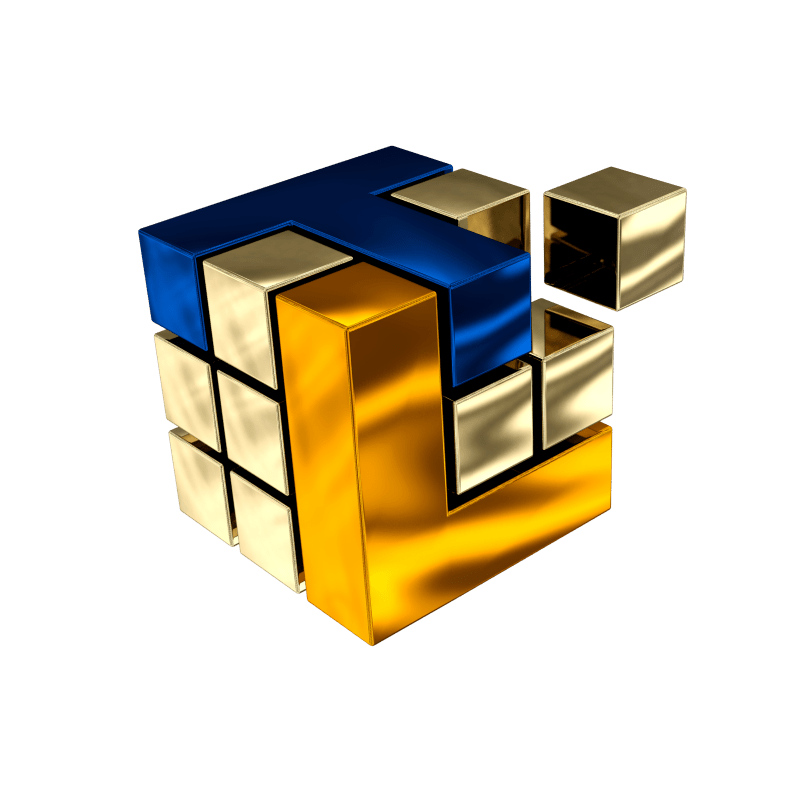 Cooling performance is also excellent; while maxing the system’s thermal load with SuperPi and FurMark, CPU temperature maxed at 53°C and GPU temperature maxed at 75°C. The one complaint I have is not with the case itself, but with the packaging. 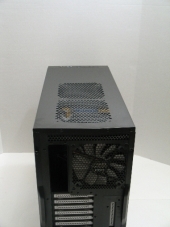 The thin, hard foam end caps were clearly not enough to protect the case during shipping; our test unit was dropped in transit and took some minor cosmetic damage as a result. The Define R4 is an excellent case for someone looking to build a low noise gaming PC without breaking the bank. 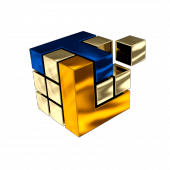 With an average online price of $100 at time of publication it is in the Goldilocks zone for mainstream PC gamers: not too little, not too much, but just right.